CipherLab 9700A, New Force on Android for Diversified Applications in Warehousing - CipherLab Co., Ltd.
Taipei, Taiwan - April 21st, 2017- CipherLab is pleased to announce the new versatility of 9700 series that supports the most demanding applications in warehousing, distribution center and manufacturing. Being in step with the growing popularity of Android-based mobile devices, the CipherLab 9700 series is now empowered to run on Android platform as smoothly as Windows® one. 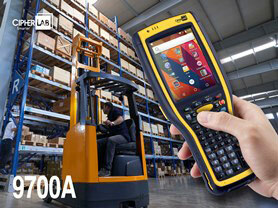 Since the initial launch in 2014, the 9700 series has grown volume in the market and becomes one of user's preferred companions for warehouse applications in various industries. To keep prominence of 9700 Windows® models, the new CipherLab 9700A is carefully built for guaranteed performance on Android platform. The 9700A adopts 2 GHz Cortex A53 Octa-core CPU and 16 GB eMMC memory to deal with manifold tasks with velocity, while the IEEE 802.11 ac dual-band is also added to enhance its efficiency in wireless communication. "The 9700 series has impressed many users in global projects through its ruggedness and capabilities in data collection and mobility. The new 9700A with Android 6.0 operating system is therefore developed to respond to user's requests and help minimize the hassle of software migration and development." Steven Liau, Chairman and President of CipherLab stated. "This new alternative also makes 9700A a unique solution in its target segment. " It's the same support to Windows® platform, users can of course enjoy those value-added utilities on CipherLab 9700A mobile computer. The self-owned or 3rd party software for different purposes, such as App-Lock, Button Assignment, Terminal Emulation, SOTI MobiControl, etc., is to be ready for wide and rapid deployment. On top of that, all accessories that make operation simple or strengthen the performance are commonly shared to eliminate any potential cost. For more details and specifications regarding CipherLab 9700A mobile computer or other CipherLab products, please visit www.cipherlab.com. CipherLab is a global leader in the design, manufacture, and marketing of Automatic Identification and Data Capture/Collection products and systems. The company's mobile computers and scanners are integrated into the networks of some of the world's best known logistics, retail, distribution, government installations and healthcare companies, helping them run more efficiently and effectively onsite and on the road. Operating worldwide, CipherLab is headquartered in Taipei, Taiwan with offices in China, Netherlands and the USA, and is publicly traded on the Taiwan stock exchange (Taiwan OTC: 6160). For more information, please visit www.cipherlab.com.